This entry was posted in Movies, Tolkien. Bookmark the permalink. It’s a…. lion butterfly with a torch? I assume you do know what it’s supposed to be? As a kid, I loved these films; have not rewatched in oh, 20 years or more :) One of them made me hide behind a couch when I was little. 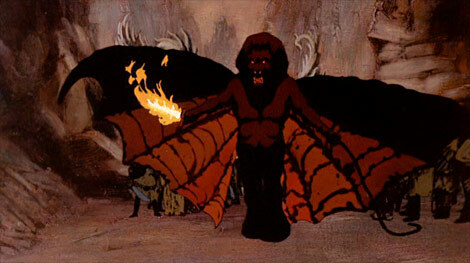 Well, it looks *just* like Tolkien’s descriptions of a Balrog, note-perfect in all respects and a thoroughly superb example of the animator’s art. There’s just one tiny little mistake. So.. figurative or actual, hard to say..
Hobbit. Rankin and Bass. Jus’ sayin. A blast from the past. I vaguely remembering see this dud on a very cold winter night in Edmonton back in the 1970’s. It left me with the sense that there would never be a “decent” film version of the Lord of the Rings. Jackson proved me wrong. His version is decent but it is still a far cry from the books. Peter Jackson’s work, be it Kong or LOTR, has a tendency to put me straight to sleep. Jackson’s work tends to put you to sleep?? Give DEAD ALIVE (aka BRAINDEAD), MEET THE FEEBLES, BAD TASTE or THE FRIGHTENERS a chance and then maybe you won’t find ALL of Jackson’s output so off-puttingly long and drawn out! !